Had anyone asked me a year ago whether the sesquicentennial commemorating General William T. Sherman's Civil War burning of Columbia would prove fruitful and inspiring for art, I would have laughed. Yet, this invitational exhibition has been most exciting. This is likely due to the four summer lectures provided by Jasper Magazine and Muddy Ford Press, the sponsors of the show. Artwork has simply been pouring out of me. 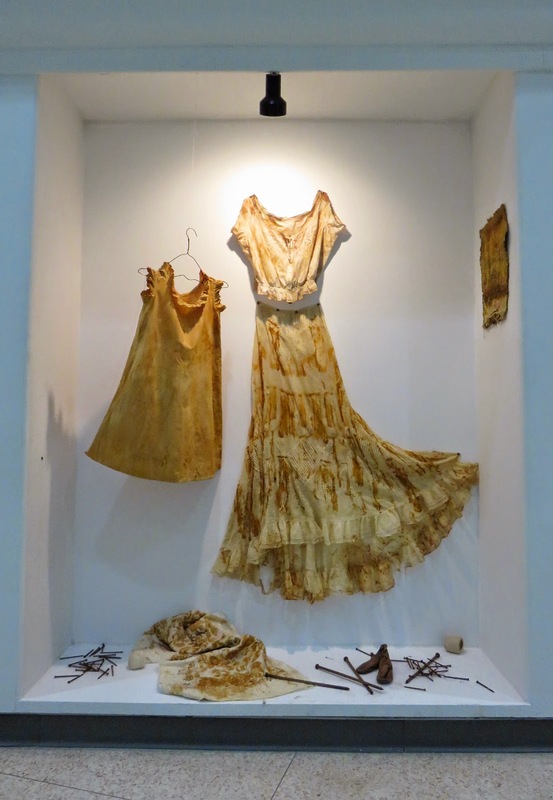 This opportunity also took a hair-brained idea for rusting and staining vintage garments with dye concoctions using plant life from my own backyard into the realm of reality. 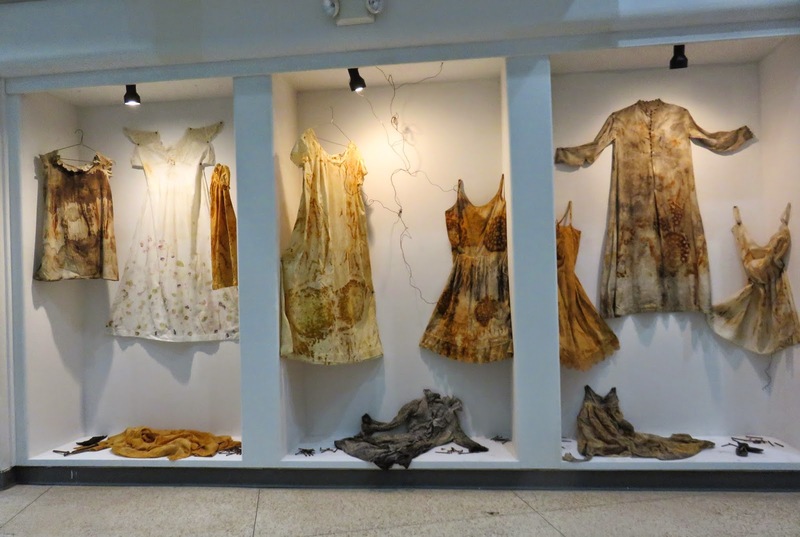 Knowing the Tapp's Art Center well (from two previous solo shows), I knew I wanted to fill the front six alcoves with these garments in order to express the fears experienced by women, children, and other marginalized citizens on February 17th, 1865. 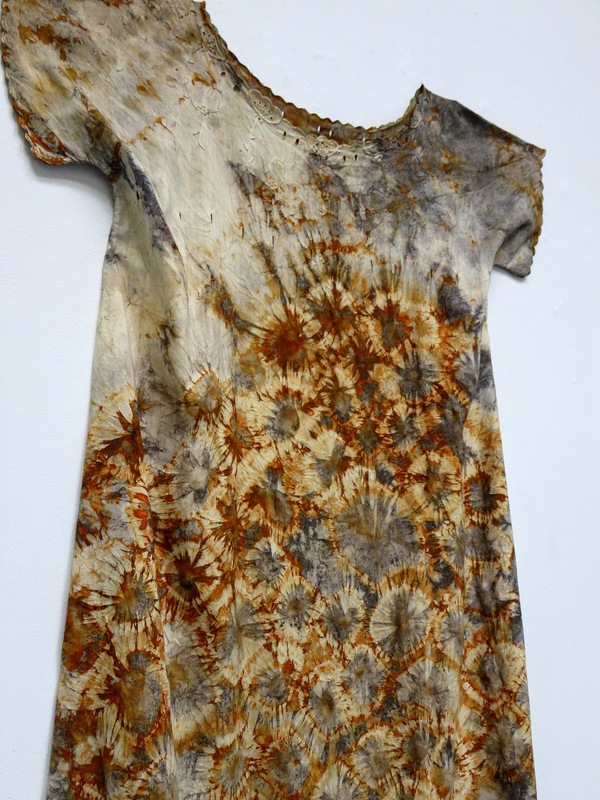 I blogged about my experiments with rusting and natural dyes HERE and HERE. I created a Flickr! album with photographs of thirteen of the garments. 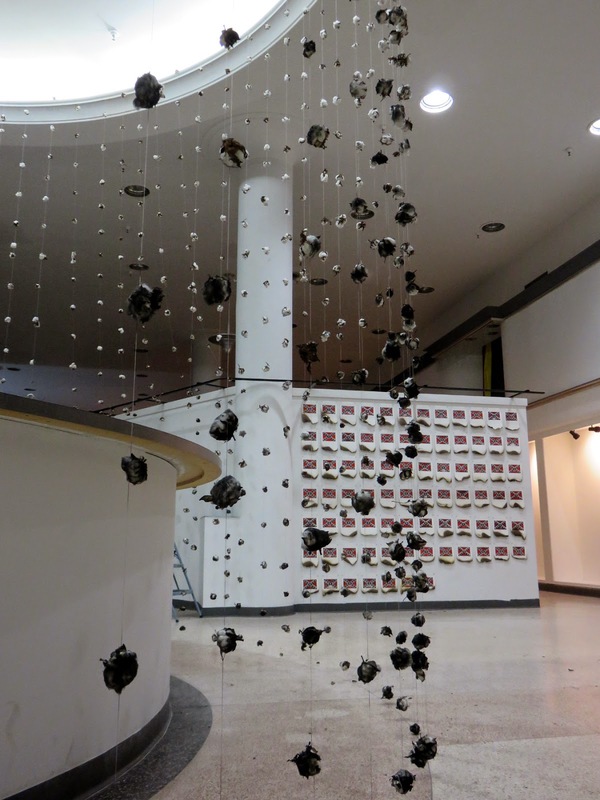 Yet, until last night the actually installation was just an image in my head. 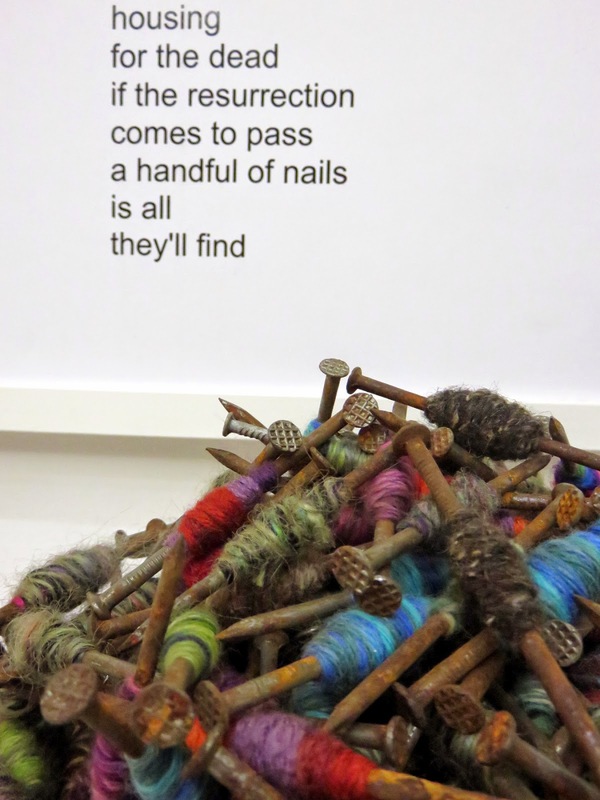 On Sunday and Monday I installed Cotton and Nails in a Coffin, two other installation for the same show, Art from the Ashes. 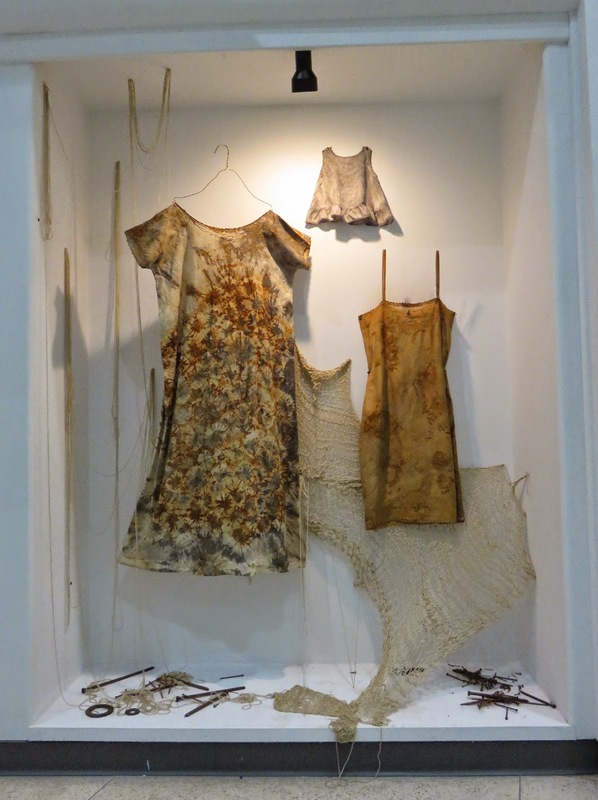 Yesterday, I got to PLAY with the collection of garments, rusted nails, wire, and other items in the actual alcoves ... making my vision come to life ... my third installation. It was SO MUCH FUN and very rewarding. 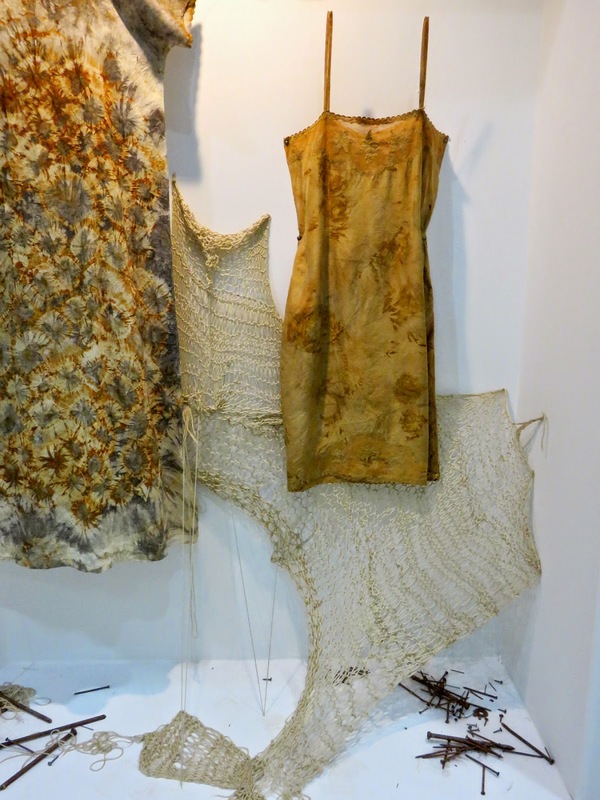 Deciding which garments went well together, which should be nailed to the wall, which would be suspended, and what would sit on the bottom ledge was like having a conversation with my raw materials. I started around 3:30 PM and finished by 7:00. 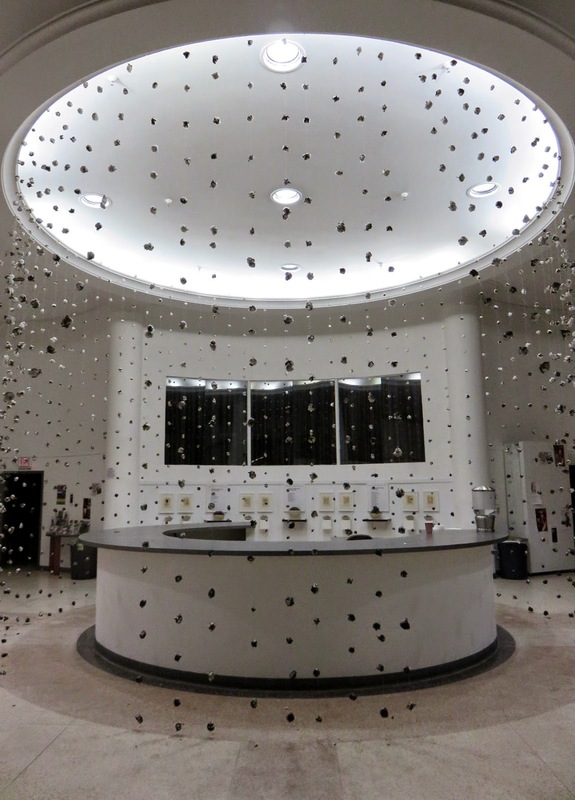 By that time, I was alone in the space with all the lights on and snapping photos. 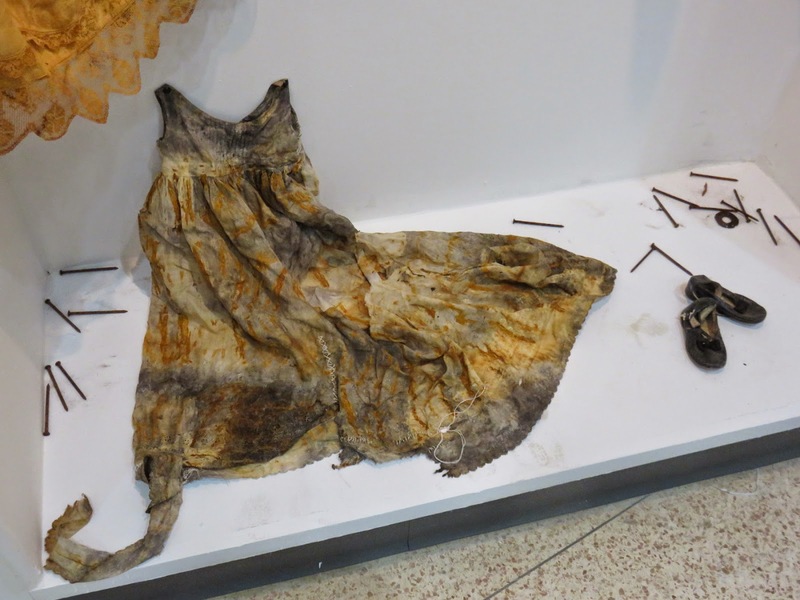 A detail shot of the sleeping gown suspended on the left is featured on the cover of Art from the Ashes, a book featuring short prose and poetry reflecting on the sesquicentennial. The opening and book launch is this coming Sunday, February first from 5 - 7. I can't wait! I didn't snap a ton of detail shots. Why? Well, I didn't have my tripod and the interior was a bit dark due to the late hour, but I couldn't resist this shot. 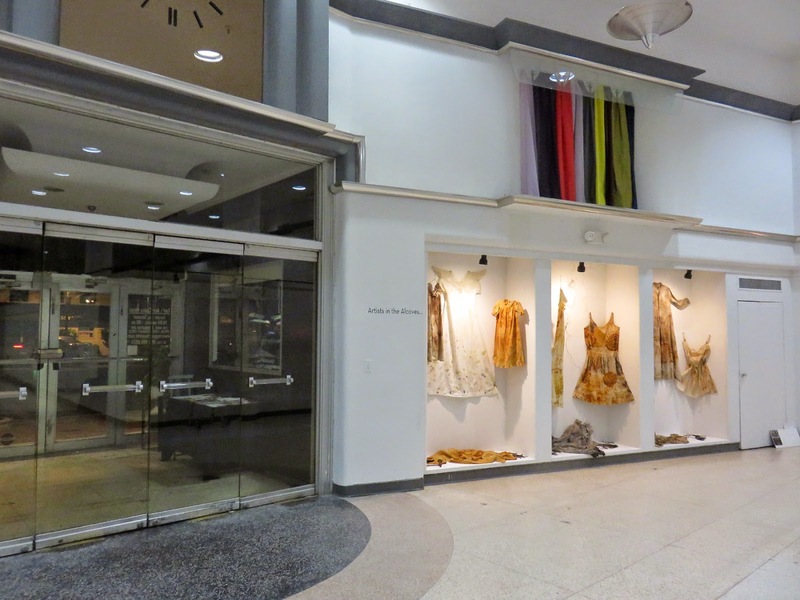 Alcoves 4 - 6 are on the opposite side of the Main Street entrance into the Tapp's Art Center. I enjoyed creating these vignettes just as much as the first three. Alcove four includes a garment that isn't rusted or naturally stained. 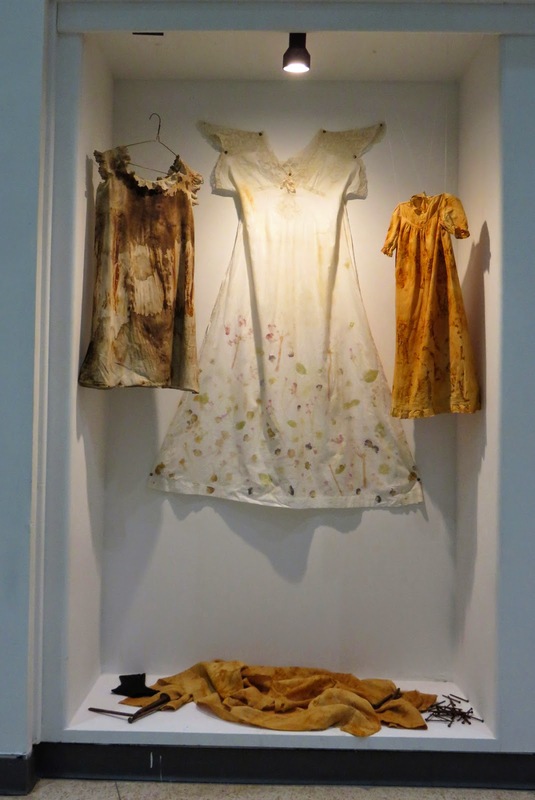 This central sleeping gown was "flower pounded". I call it Antebellum and consider it representational of the times before the Civil War. I blogged about it HERE. I used one of the tablecloths I rusted. I have two other tablecloths with rust and natural staining but didn't use them. Sometimes I don't need everything I gather together for an installation. I think I might free motion stitch one of the tablecloths into its own art quilt ... if I can find the time! LOL! One of the last things I tried was using acorns and seed pods from wintering crepe myrtle. It worked well ... even on the garment sent by another cyber friend, Martha Ginn. 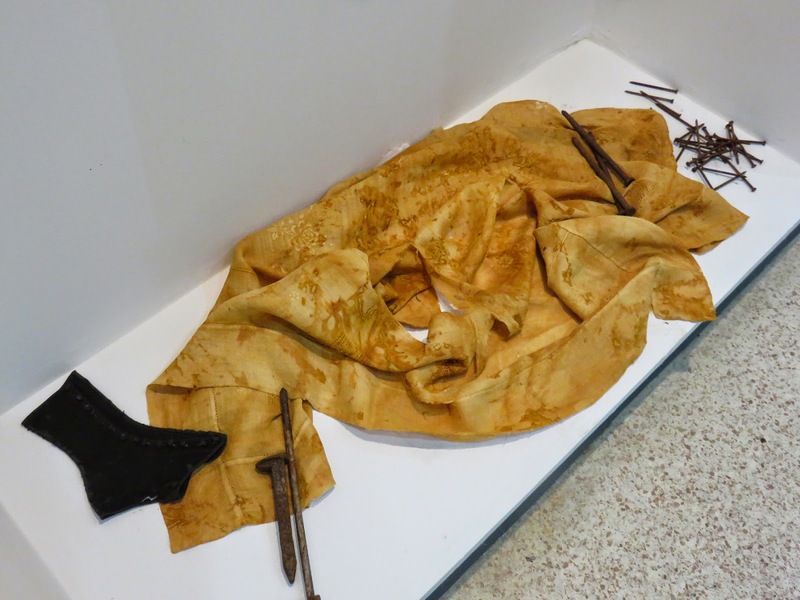 The pods and acorns produced a strong enough black dye that even the polyester content in this garment was affected. I loved using it on the bottom ledge ... almost like it was "dead" or run over by war. Thank you, Martha! This is the last of the six alcoves. 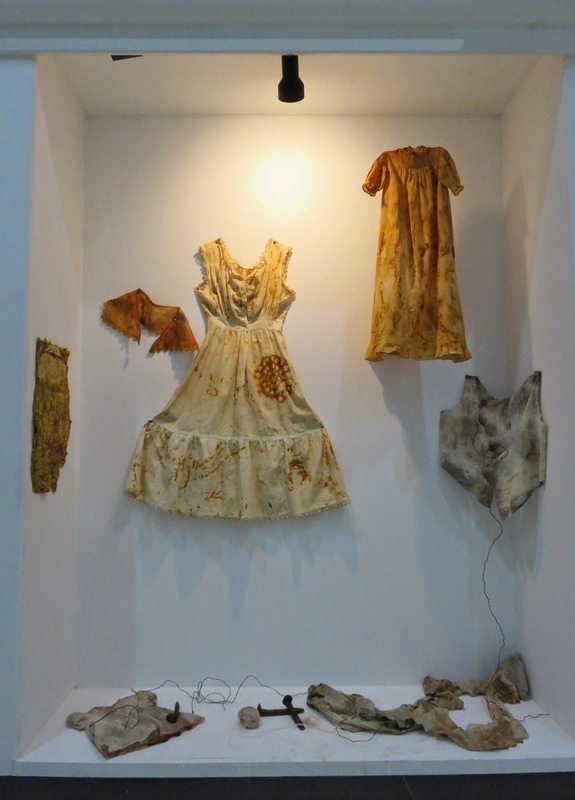 It includes one of the children's garments that seemed to fall apart during the rusting and natural dyeing experiments. I started trying to add stitches in an off-white thread ... obvious patch marks ... but never finished. Yet, it looks great on the bottom ledge, another totally damaged work suggestive of ruin, fear, and the horrors of war. I look back on yesterday and marvel. It was a very good day. 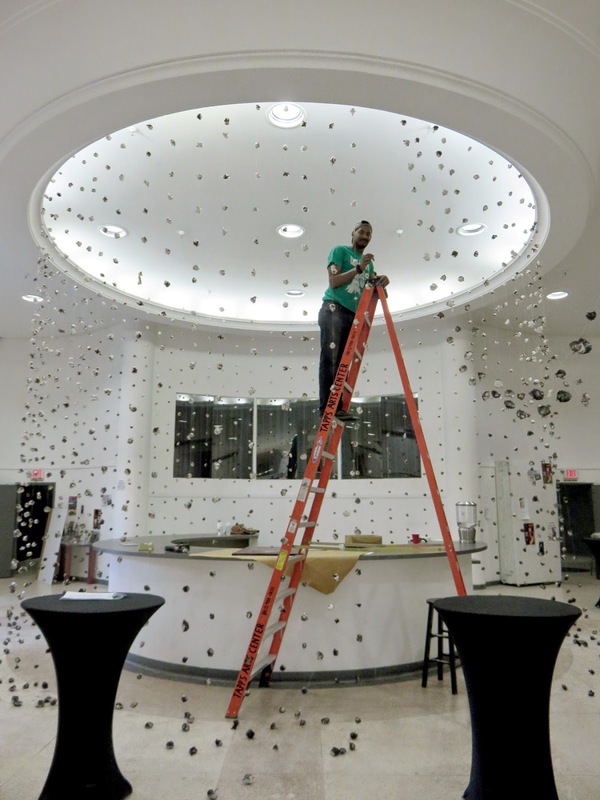 Installing Night of Terror was great but it wasn't the only artistic thing I did. 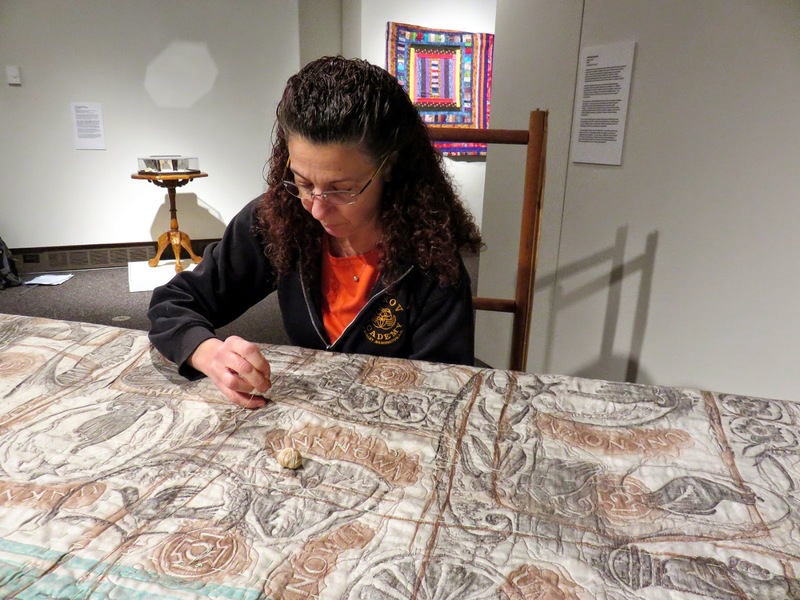 In the morning I went to the McKissick Museum to put the first quilting stitches on my work Stitching Together. 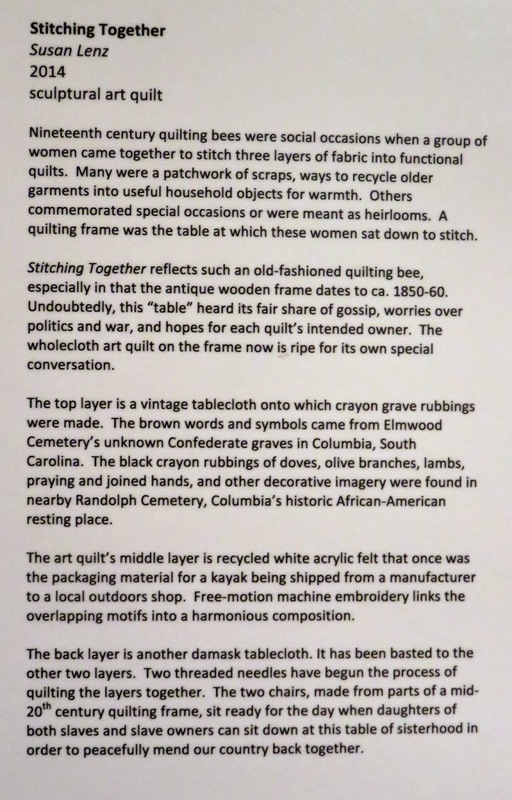 This sculptural art quilt includes brown crayon grave rubbings from unknown Confederate soldiers' markers in Elmwood Cemetery here in Columbia as well as black crayon grave rubbings of lambs, praying hands, doves, olive branches and other symbols of peace from the nearby, historic African-American Randolph Cemetery. The rubbings are on a vintage tablecloth and free motion stitched to recycled, white acrylic felt that was once packaging material for a canoe being shipped to my local outdoors shop. 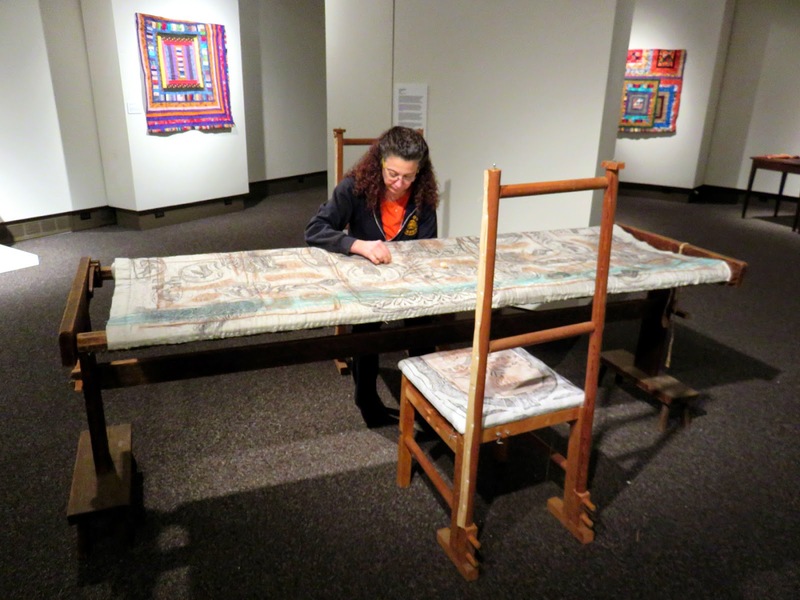 These two layers were next basted to another vintage tablecloth and put onto the mid-19th antique, wooden quilting frame. Thus, the three layers are ready to be quilted. I made the chairs as well from pieces of a newer quilting frame donated by Kathleen Loomis. 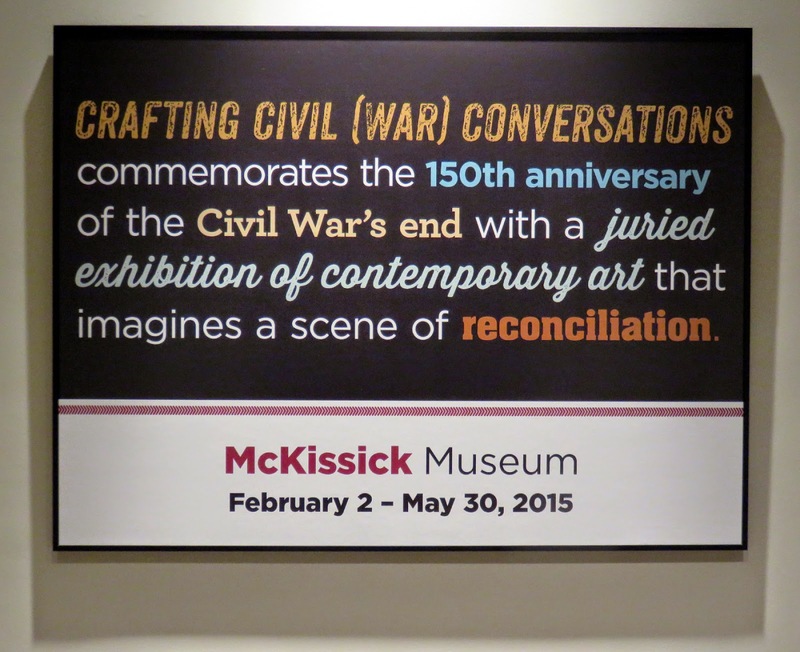 While I stitched, one of the McKissick's curators and staff person were hanging other work in the exhibition. 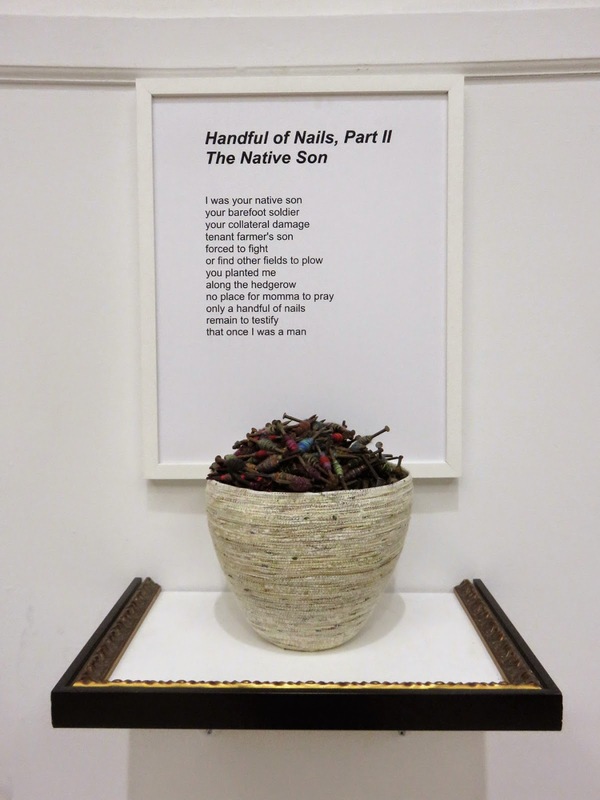 This show asked artists to submit work in response to a Martin Luther King quotation in which he looked forward to a day when sons of former slaves and sons of former slave owners could sit down to a table together. For me, I see my piece as a place for daughters of former slaves and daughters of former slave owners might sit down and mend our country's racial differences. Below is the signage that accompanies my piece. 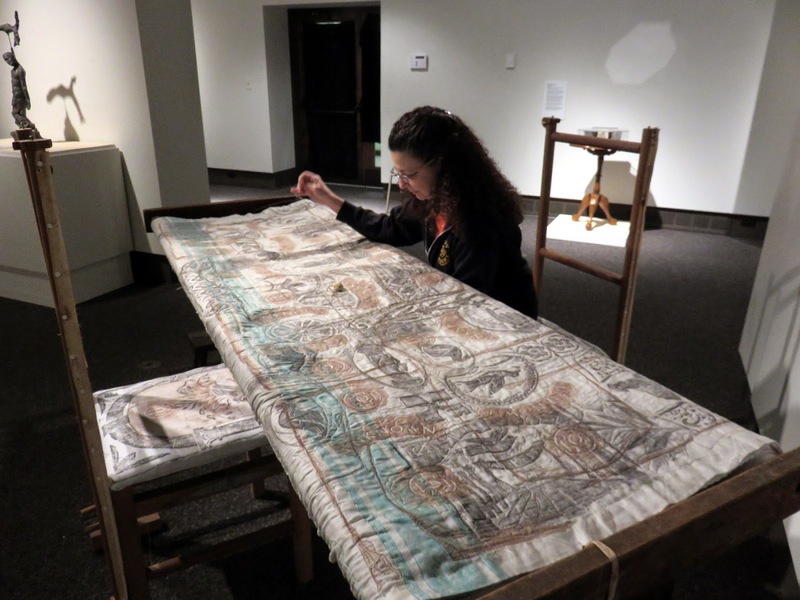 I could have stitched all day ... but then I won't have gotten to play with my installation! 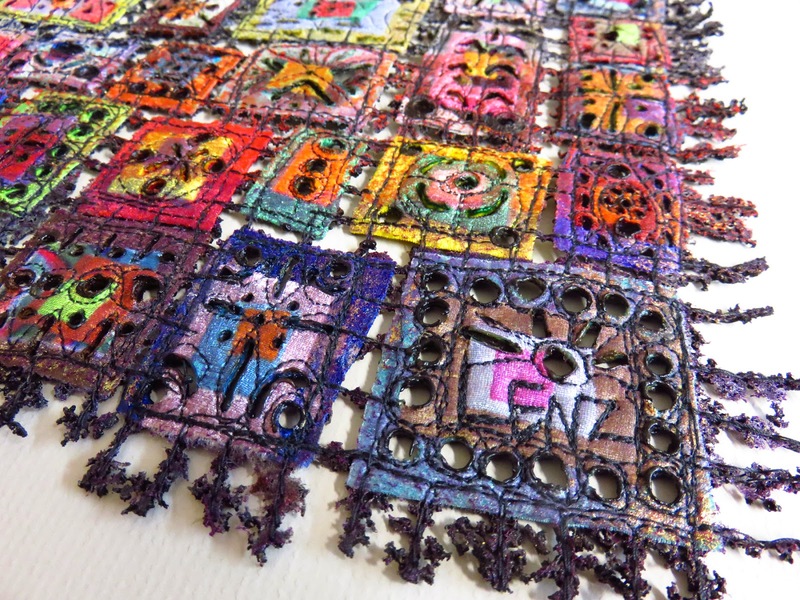 I am linking this post to Nina-Marie's "Off the Wall Fridays", a site for sharing fiber arts. Two installations up and one more to go! 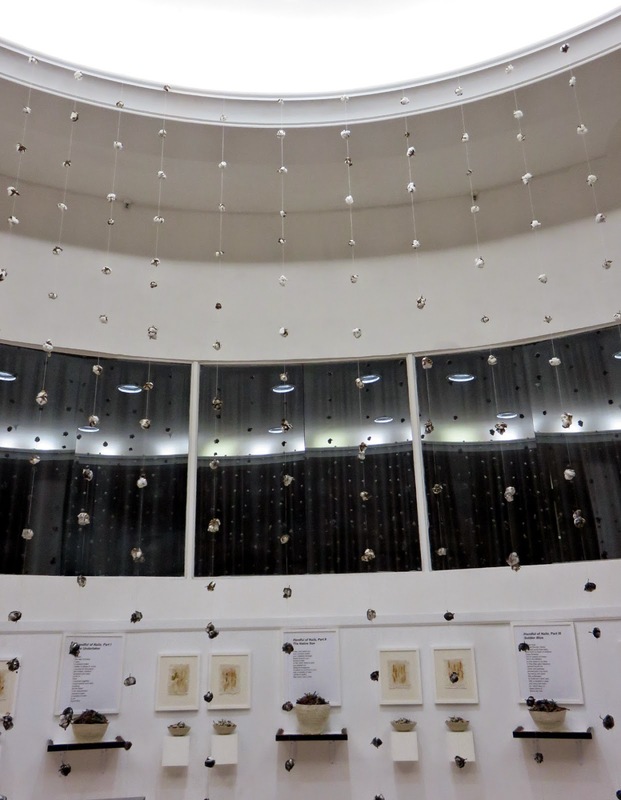 Last night I put the finishing touches on the seventy-two strands of suspended cotton bolls that surround the circular desk at the Tapp's Art Center. On each side, six strands have been pulled to the side ... allowing access to the desk and foot traffic in the area. I'm very, very pleased with the work. Behind the circular desk is a curved wall. 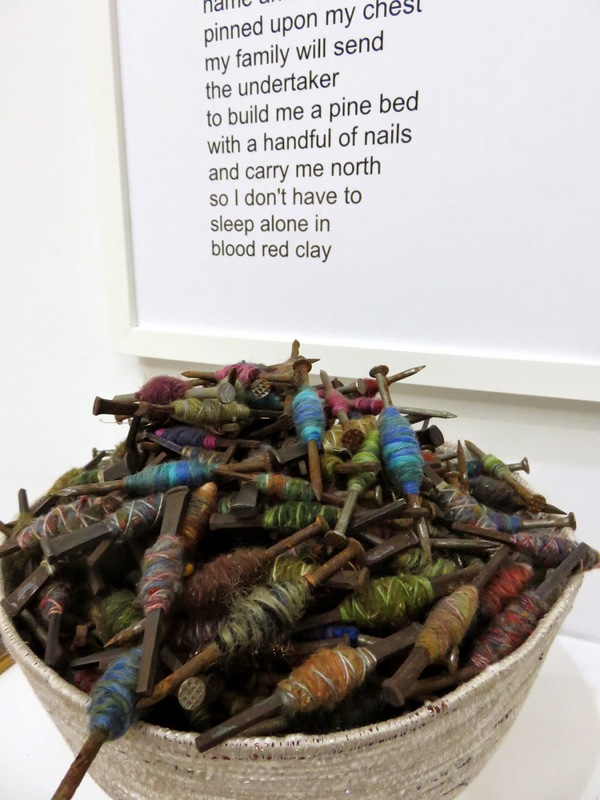 Last night Nails in a Coffin was hung in perfect quietness. I was completely alone in the space ... an awesome experience in and of itself. This work is a collaboration with poet Al Black. 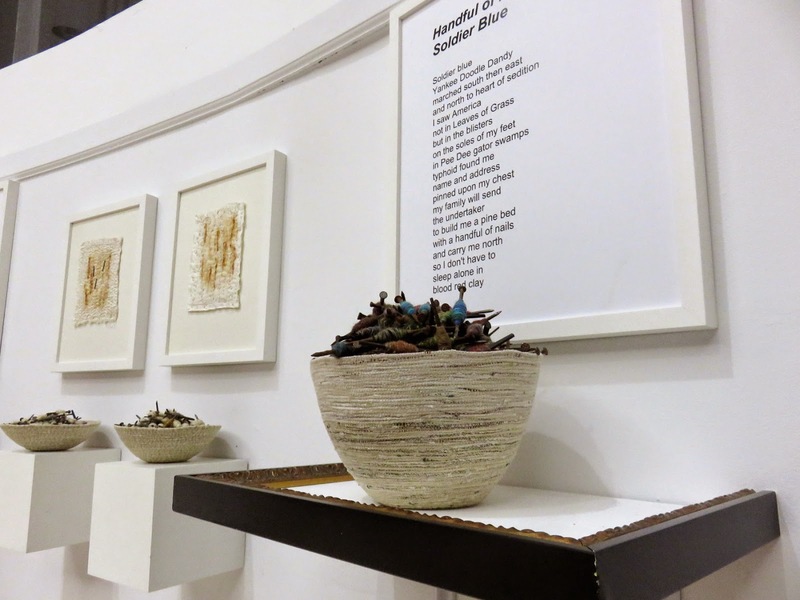 His three poems (which I might get his permission to include on my blog) are framed above three ledges. 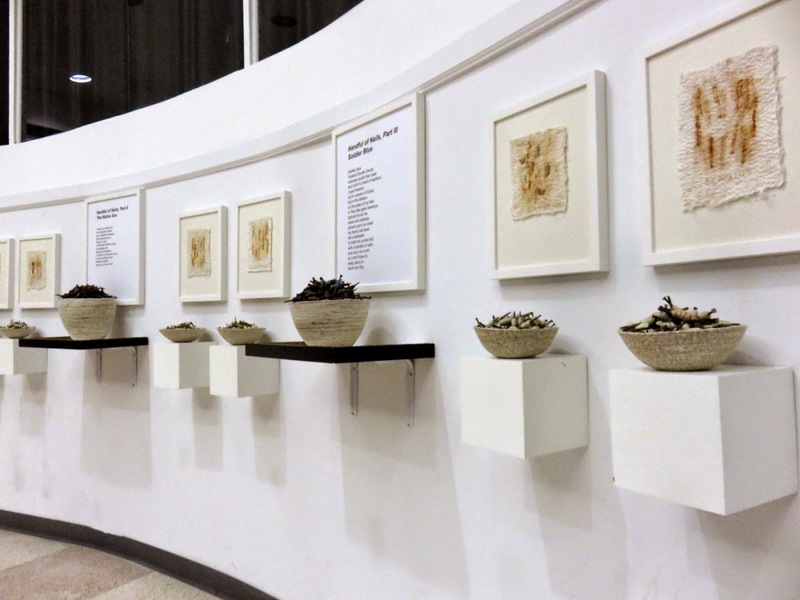 Each ledge has a fiber vessel filled with wrapped, rusted nails. 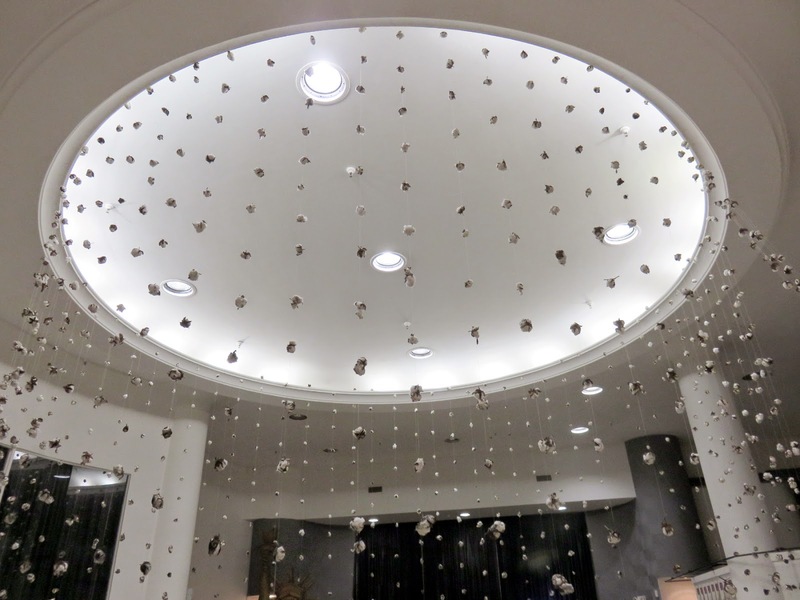 There are also eight wall-mounted, white cubes. On each cube is a shallow fiber vessel filled with more wrapped nails. 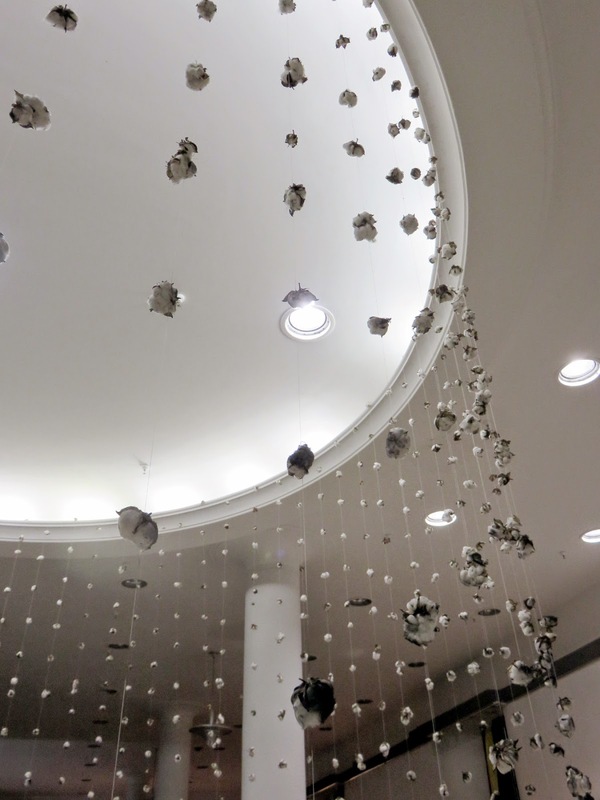 Above the cubes are framed fiber works. 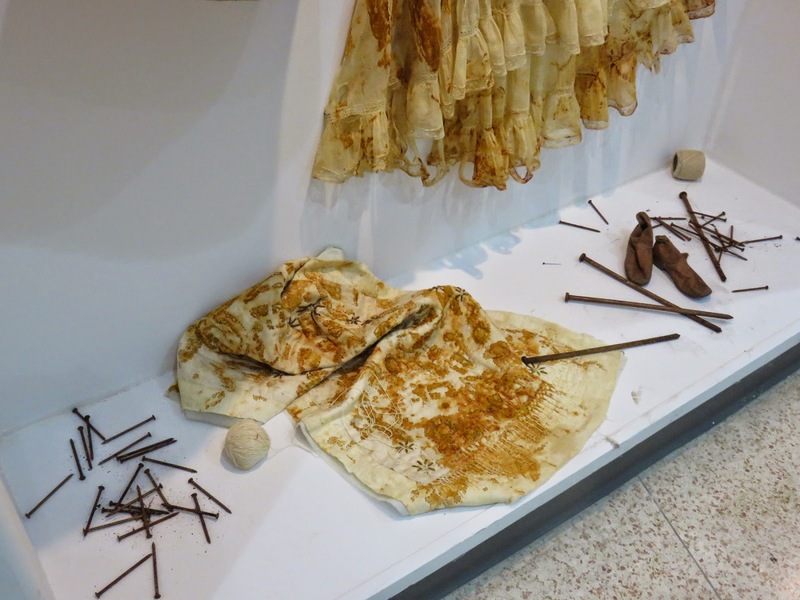 Each includes the impressions of rusted nails on scraps of vintage napkins. I'm very pleased with this work too! 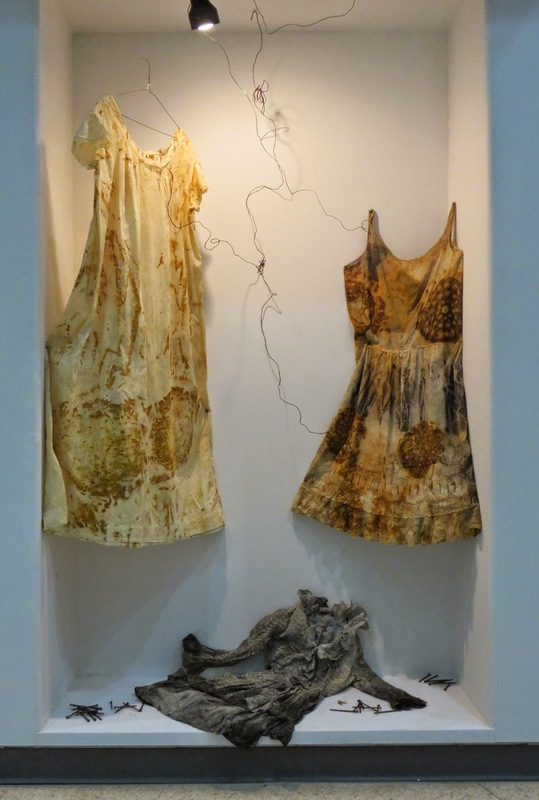 The opening of Art from the Ashes is this coming Sunday, February the first from 5 - 7. The accompanying literary volume (on which my work is featured!) will be available and several poets, including Al Black, will be reading. 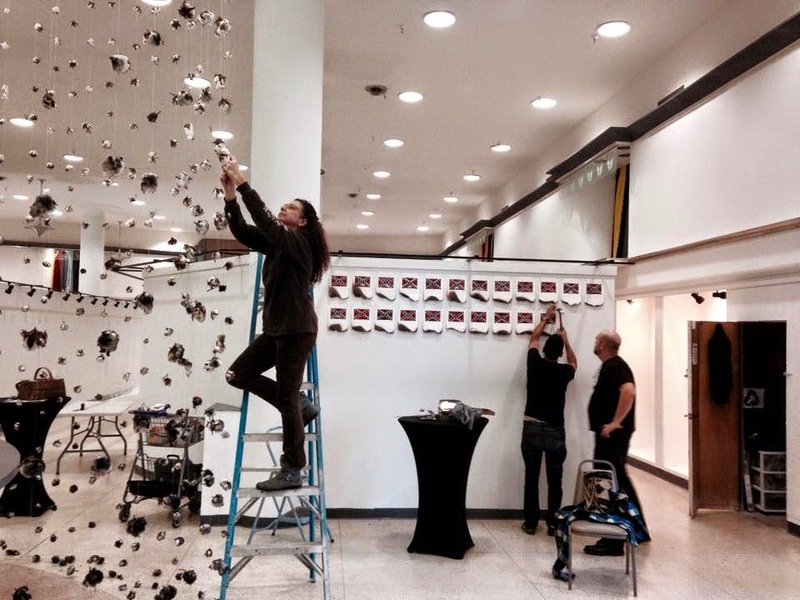 On Thursday, February 5th from 7 - 9 is an artists' panel discussion. I'll be there for that too! I'm very grateful to Cindi Boiter and her husband Dr. Bob Jolley for making this exhibition possible through their businesses Jasper Magazine and Muddy Ford Press. 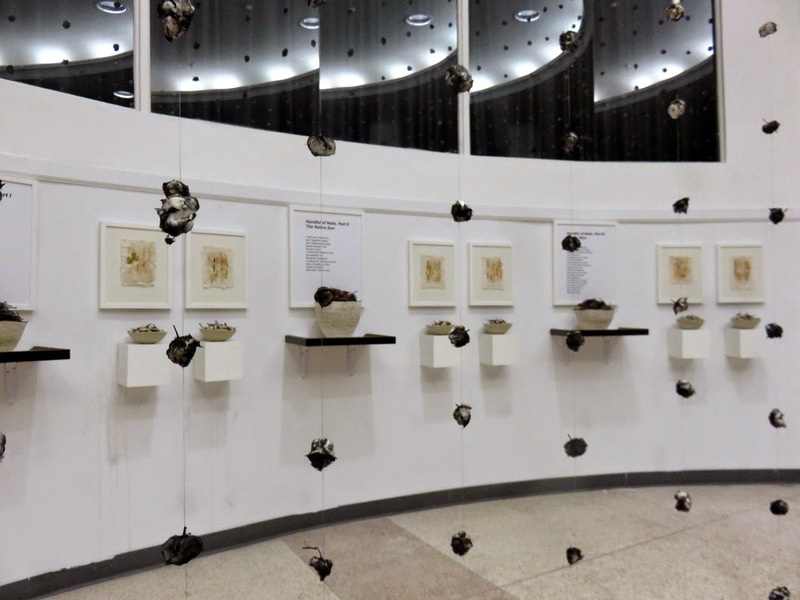 Working toward this exhibition has proved to be one of the most inspired experiences in my artistic life. The work is still pouring out of me and will continue even after the month. Several months ago I would have doubted that the sesquicentennial of General William T. Sherman's burning of Columbia could provide such a powerful catalyst for making artwork ... but it has! Generally, I like to include more writing with my blog posts ... but not today! Why? 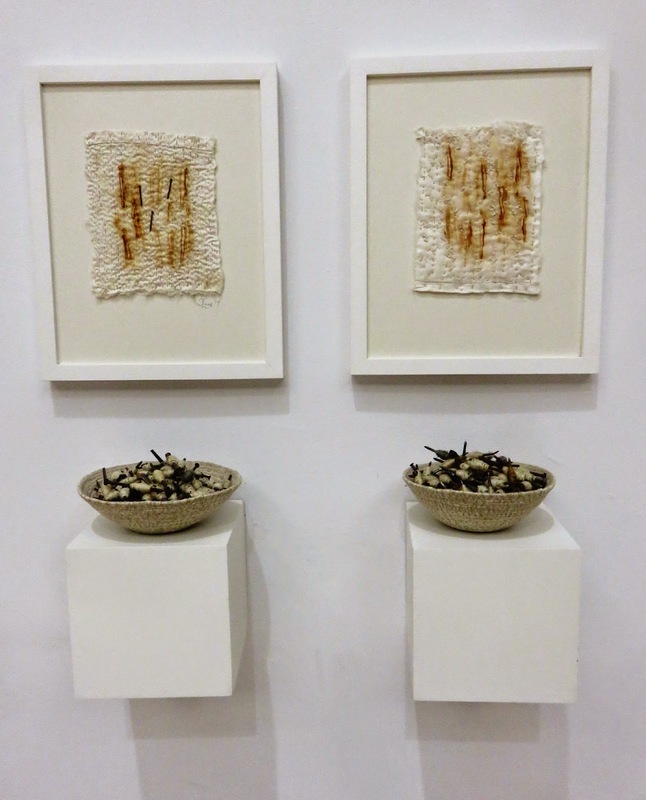 Well, I've got a third installation to hang for this show! With any luck, I'll be blogging again ... more photos. So ... just enjoy the images provided below! This weekend was wonderful. I'd been looking forward to it for months. Why? 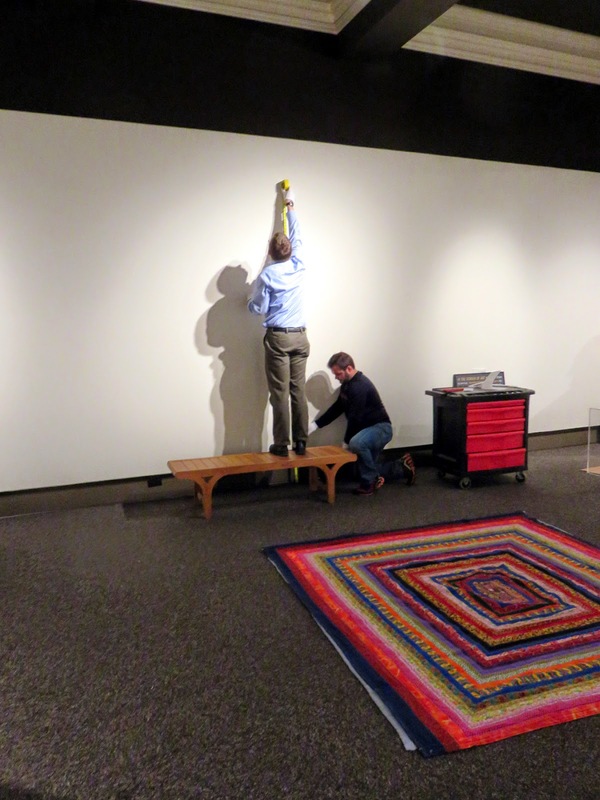 Well, Sunday afternoon was the first opportunity to start installing work for the upcoming Art from the Ashes exhibition at the Tapps Art Center. I'd made arrangements in advance. Some of the artwork will be hung by the Tapps Art Center staff. 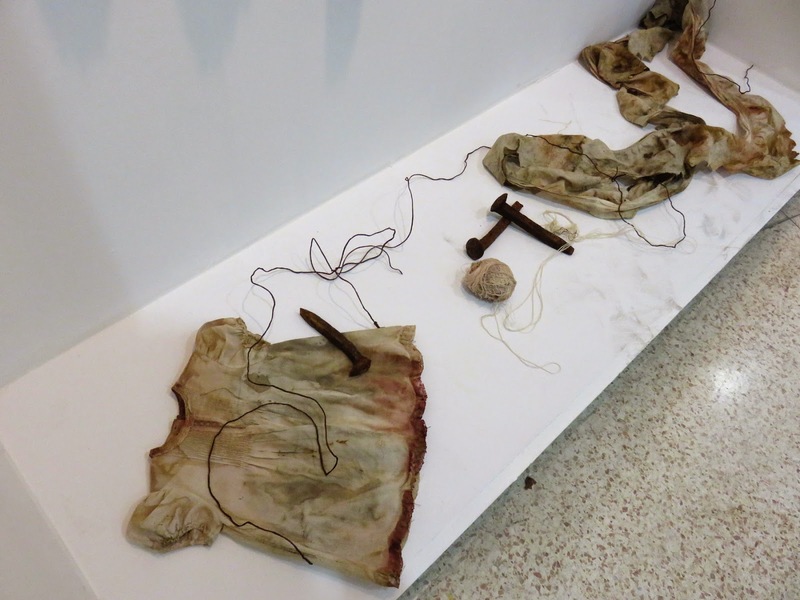 Some installations, like Alejandro Garcia-Lemos', was hung by the artist and his own assistant. My cotton bolls, however, needed a little of both! I couldn't have done this without the 6'3" Daniel who works at Tapps. 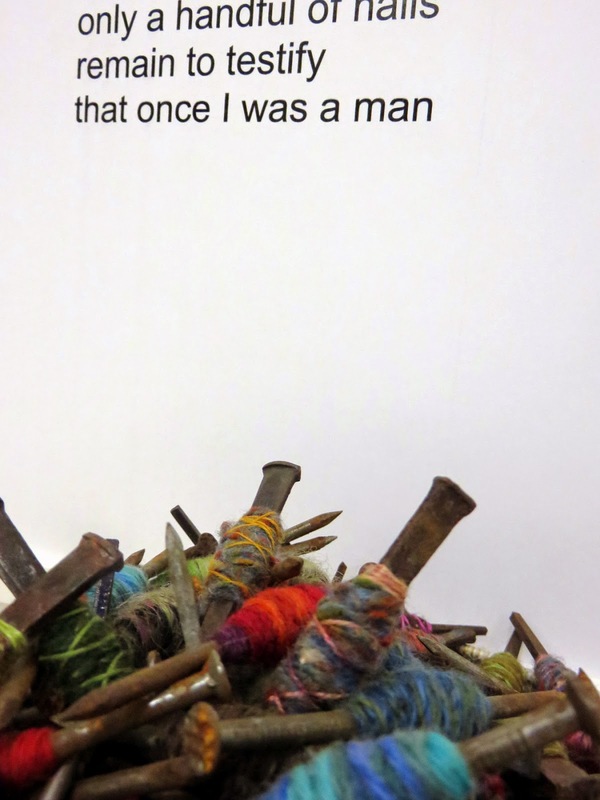 I handed up each strand of cotton. 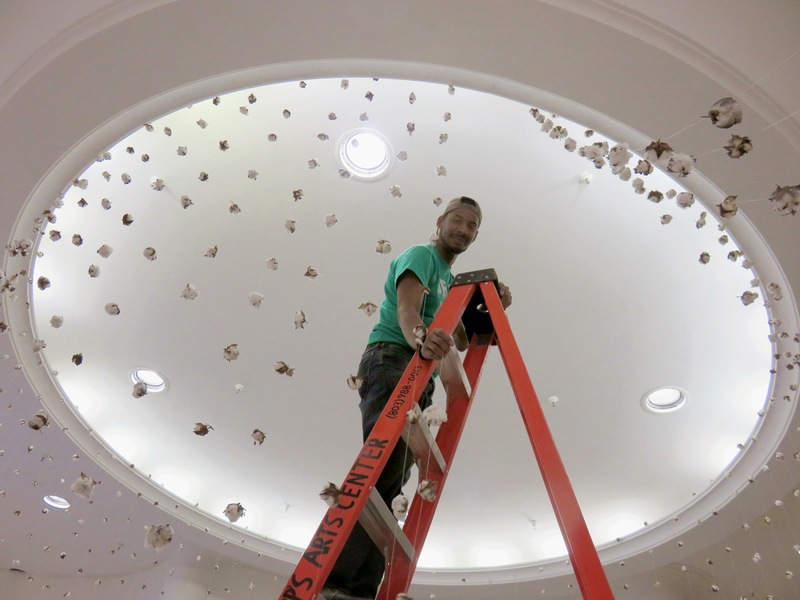 He went to the very tippy-top of the ladder to hook them in place ... seventy-two times! In order to create this work, I'd consulted with Caitlin Bright, the Executive Director at Tapps. We thought 16 - 18 feet would be the correct length because the ceiling is somewhere in the neighborhood of 20' in height. Caitlin's floorplan says that the dimension of the recessed circular dome is 47' 9". I googled for the equation for finding the circumference. 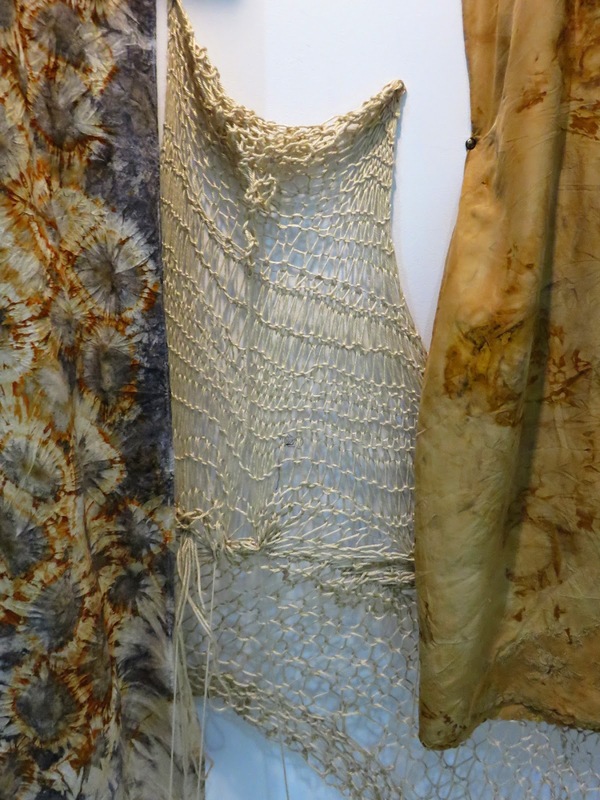 The results indicated that we'd need to hang the strands of cotton every 24 1/2". Well, something wasn't correct. Perhaps I measured incorrectly in my living room and made each strand about a foot longer than needed. Also, we had them closer together than 24". Yet, both these things didn't matter at all. Far better to be a bit long than too short. Far better to have them closer together rather than looking too spartan in arrangement. I'm now working with the strands ... shortening them by stitching some of the bolls together. This actually looks even better ... a more creative sense of texture ... a more random appearance. I'm halfway finished with this task. I'll be returning to the Tapps Center soon. 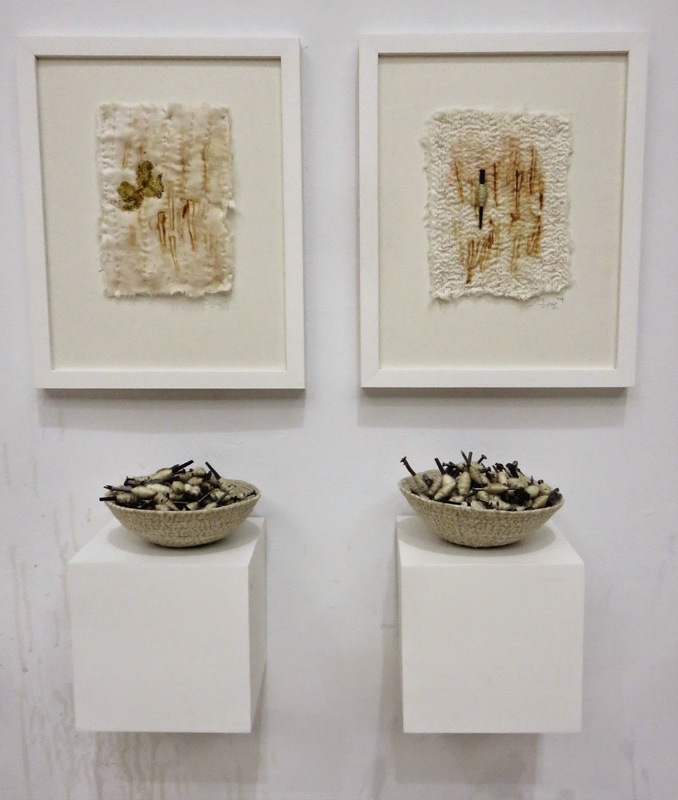 Once these cotton bolls are perfect, I've got two other installations ready to hang! Another blog post or two will be written before next Sunday's official opening from 5 - 7! Can't wait! 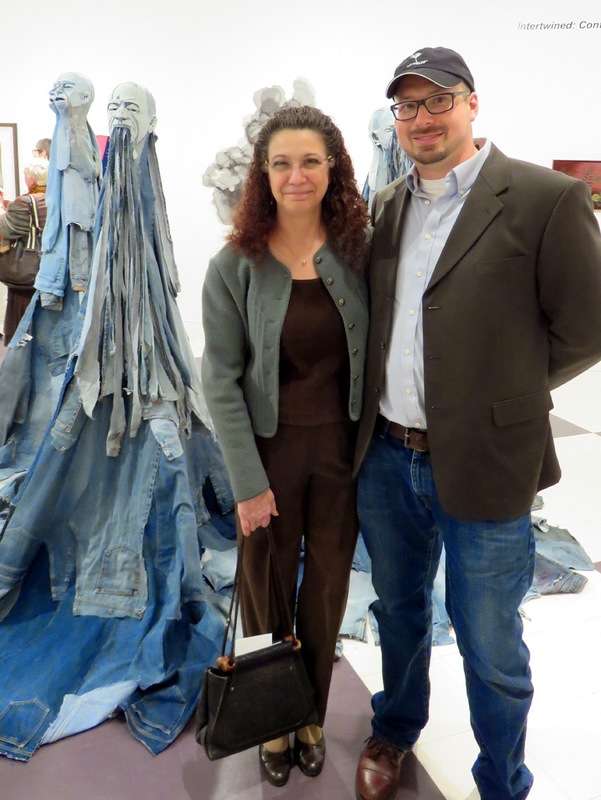 On Saturday, Steve and I drove to Duluth, GA for the artist's reception of Intertwined. I often can't attend shows in which my work appears due to distance and my unwillingness to give up precious studio hours. 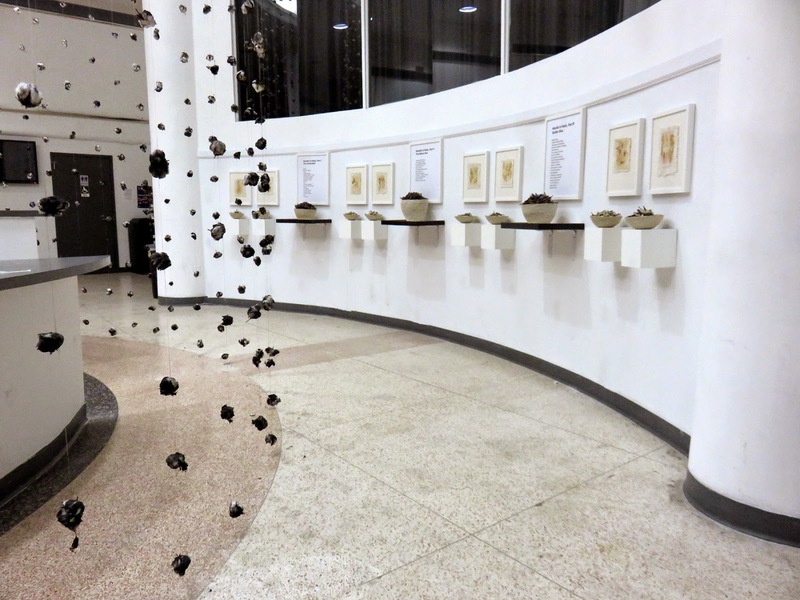 Yet the stellar list of artists accepted into this show was too impressive to ignore. Plus, Steve and I drove by the Cobb Galleria convention center, the site of the American Craft Council's Atlanta show in March. It was nice to get a look at the loading dock, parking, and the basic "lay of the land" before pulling up in the rental cargo van! The exhibit lived up to and beyond my expectations. 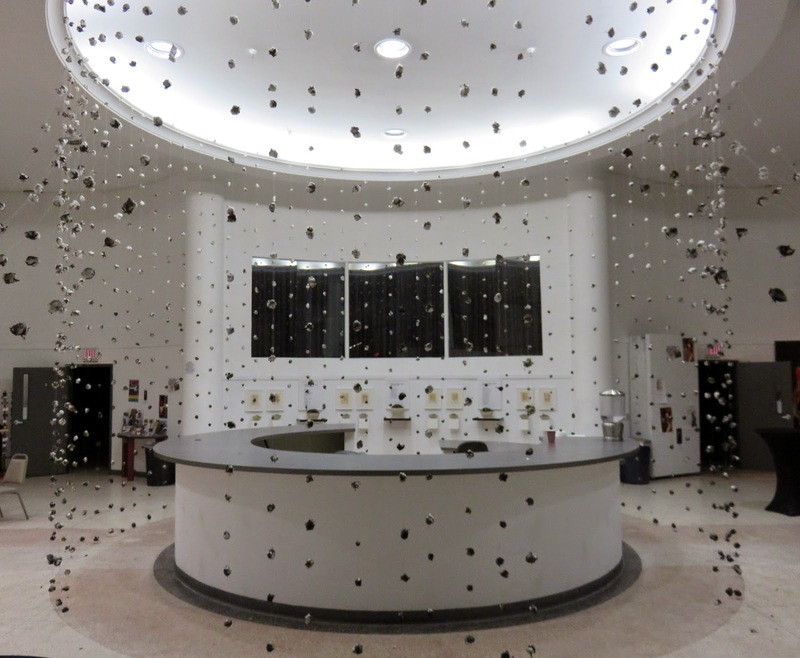 The Hudgens Art Center is a fabulous facility. The staff and board of the Southeastern Fiber Arts Alliance are wonderful. I met Leisa Rich, a talented artist who bought one of my pieces last year, and Dot Moye, of Davis-Moye art consultants. Plus ... there were awards! I'd totally forgotten about them until it was announced that there were prizes for three honorable mentions and a "Best of Show". 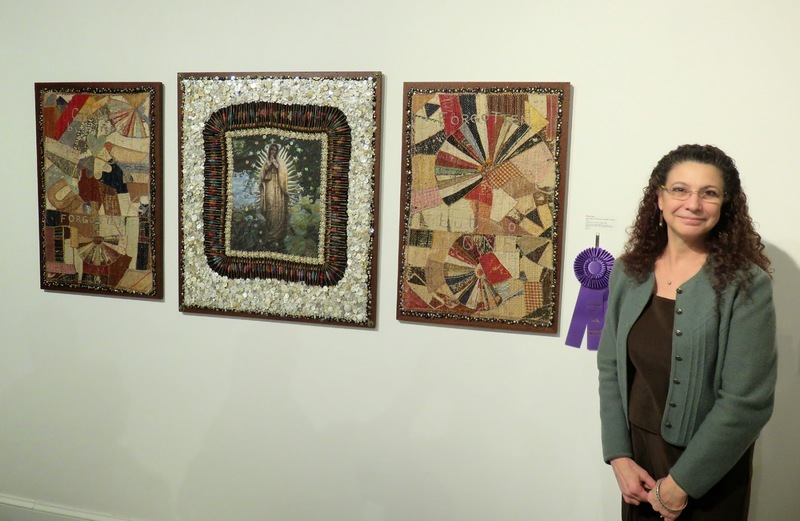 Unexpectedly, my piece won an honorable mention and another South Carolinian fiber artist, Jim Arendt, won the top award! What a fantastic night! 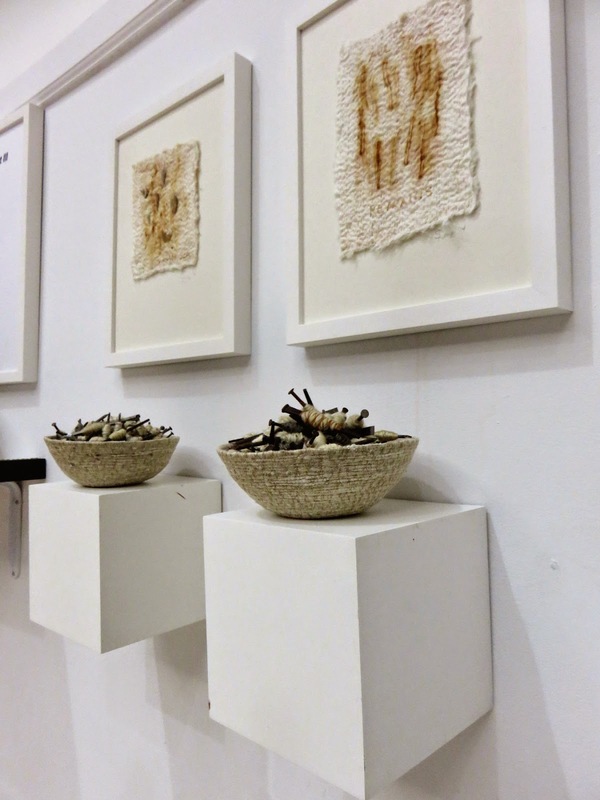 Now, please don't think I been flitting around the country and playing with cotton installations without also being busy making new work! I'm still stitching ... trying to get ready for the upcoming ACC shows. I'm in Baltimore next month and returning to Atlanta in March! I've got to have work finished, framed, and ready to go. Here are the two latest works! 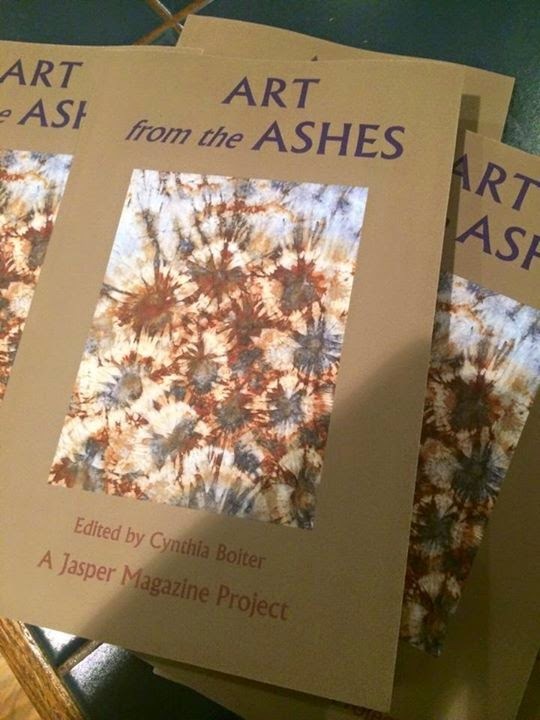 This morning I opened an email that let me know Cindi Boiter, editor of Jasper Magazine, posted an image of the cover of the new book she edited, Art from the Ashes. This was exciting news! Why? 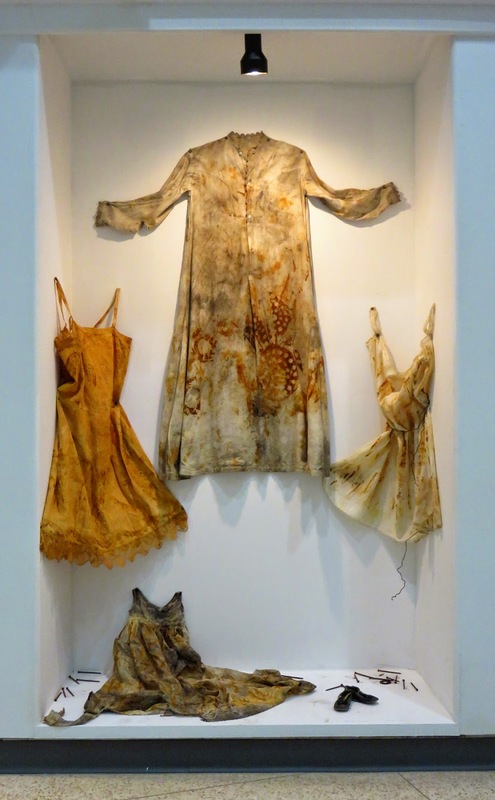 Well, several months ago Cindi requested a CD of my images ... all the photos of the rusted and naturally stained vintage garments I was making for the upcoming art exhibit ... also called Art from the Ashes. So, I knew one of my photos would be on the cover. I didn't want to know which one. I wanted it to be a surprise, a chance to share the news on the appropriate day, not keep a secret for weeks on end. 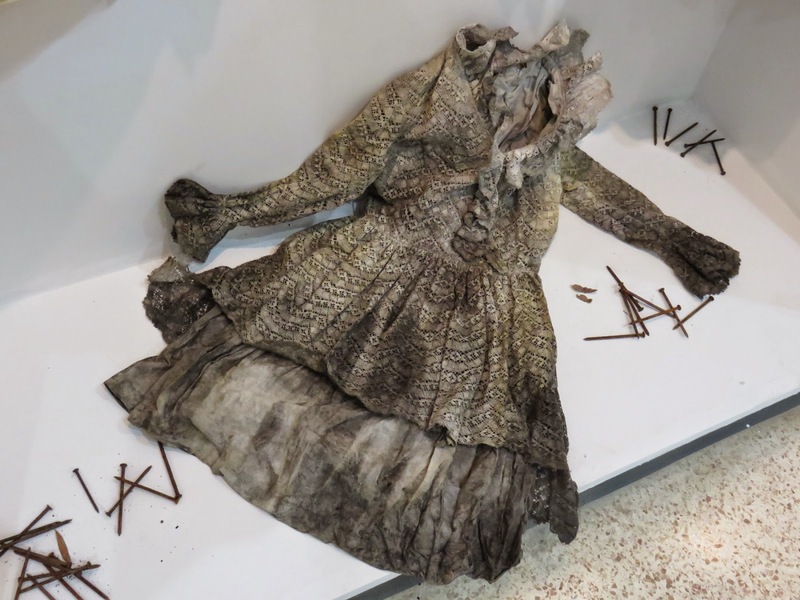 Quickly, I clicked to the link and saw the detail from this former sleeping gown. Excellent! It is quite an honor to have my work featured in this way. Thank you, Cindi! Later today, Steve and I are driving to Duluth, GA. It is just outside Atlanta. 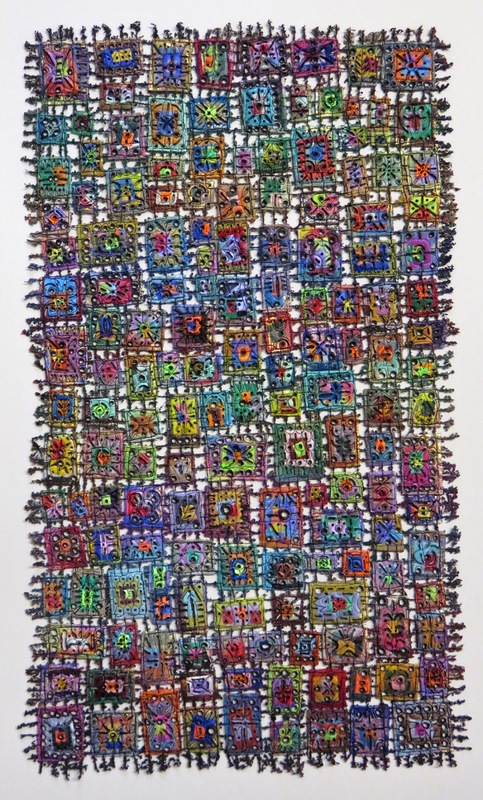 Tonight is the opening reception of Intertwined: Contemporary Southeast Fiber Art at the Hudgens Center for the Arts. 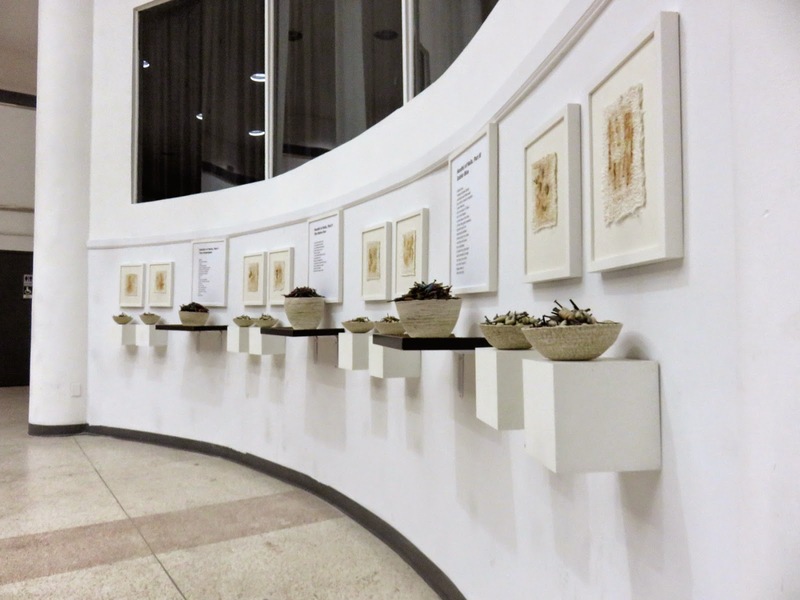 This exhibit runs from January 13th through March 21 and then travels to the Unitarian Universalist Congregation of Atlanta, Atlanta, GA from Mar. 23 - Apr. 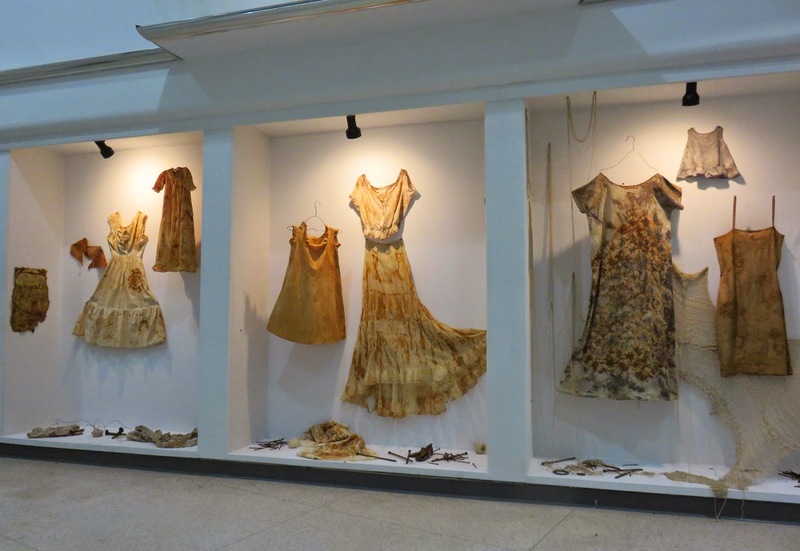 21; Lamar Arts, Barnesville, GA from May 1 - June 27; and finally to the Annette Howell Turner Center for the Arts, Valdosta, GA from Aug. 3 - Sept. 30. 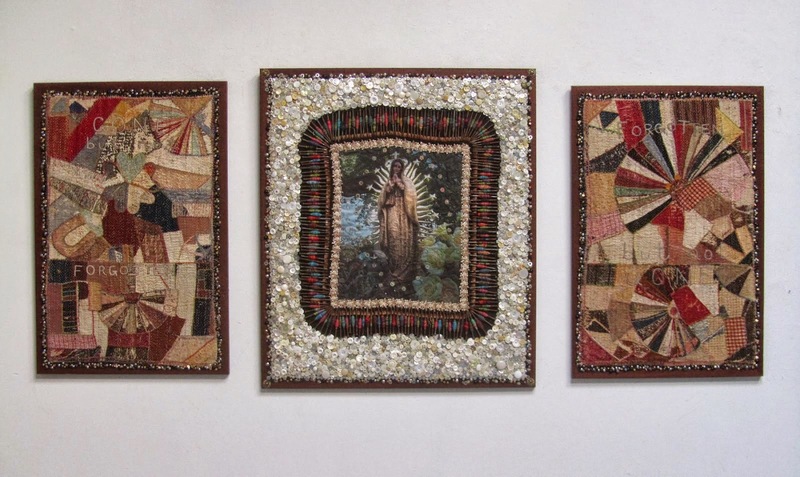 My piece, The Virgin of Gone and Forgotten Triptych, is included. We return early on Sunday morning. Why? Well, by 2 PM Sunday afternoon I'll be at the Tapps Art Center hanging three installations and two art quilts for Art from the Ashes. That opening is the following Sunday, February the first from 5 - 7. There's a panel discussion on Thursday, February 5th from 7 - 9. This is quite an exciting time in Columbia!